Niro's Gyros on University Avenue in Urbana. The Italian beef craving set in again. I’m just not going to go back to Illinois and not get one. 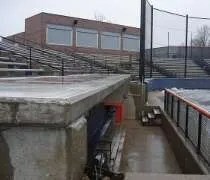 I left Illinois Field on my lunch break and headed towards Green Street to get lunch like I always do. Problem is, when I got there, everything was closed. U of I is on spring break and everything closed up with them. I panicked a little. Where else was I going to go? I was driving around and I came up to University Avenue. Then it clicked. There was a little Greek place up the road where I could get my Italian beef. 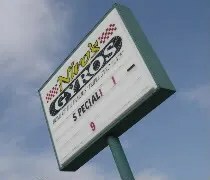 Niro’s Gyros is located on University near Lincoln in Urbana. Niro’s has several locations in the Champaign/Urbana area and there are even stores that I know of in Bloomington, IL. I have no idea why Greek places tend to have Italian beef in Illinois, but it’s fairly common. Places like Niro’s are almost cookie-cutter to the extent that you know what’s on the menu before you get there. You should know me by now. When I’m on the campus of a large university, I go looking for pizza-by-the-slice. I was in Champaign to witness one of the worst basketball games I have ever seen. 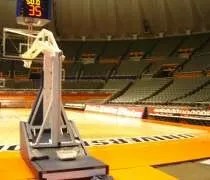 If you happened to watch the Penn State vs. Illinois basketball game, you know what I’m talking about. Before that atrocity, I needed to find dinner. Most of my co-workers went to a Mexican place, but I wanted pizza, so I headed to Green Street and started walking. It’s always fun when you’re in a strange city to go out to eat with the locals. I was working at Assembly Hall for a University of Illinois basketball game with a few other guys who live in the area. 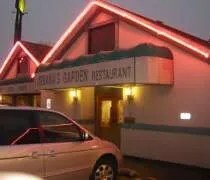 I’m somewhat familiar with the Champaign/Urbana area, but not nearly as familiar with the local joints, so I was happy when one of my co-workers took the lead and suggested we go to Urbana Gardens for dinner. Urbana Gardens sits near Interstate 74 in Urbana a few miles from campus. It’s one of those down home, friendly restaurants where it’s more about having a good time than white table cloths. Five of us left the arena together for lunch. When we showed up at Urbana Gardens, we were relieved to see the holiday shoppers didn’t make it down this far. The place was pretty empty for a Saturday night and we were seated at a table together. I sort of felt sorry for the other patrons. We were loud. The guys I was with all have a sarcastic sense of humor and the waitress was playing along, so things got a little noisy. The table sitting next to us didn’t seem to mind as eventually, they started asking questions about our line of work. I made a mistake. 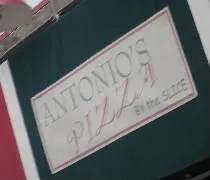 I had planned on going to grab a couple slices of pizza after I got off work from a pizza joint that gets rave reviews. Instead, I chose to go get BBQ. That in itself is not a bad choice. The restaurant I chose was the bad choice. 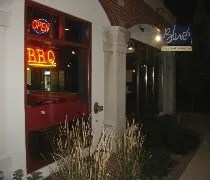 I noticed Blues BBQ last night when I went to Manolo’s (review HERE) to get pizza. I almost went there then because it *looked* like a neat place. When I left Memorial Stadium tonight about 8:00, I headed back to the area to get some Q. Traveling has really wore me out….and made me hungry. I’m sitting in my hotel room at the Hilton Garden Inn in Champaign and even though I’ve had two meals, I’m hungry. I get on my laptop and do a search for pizza joints that sell pizza by the slice. That’s what I really love about college towns. You can usually find a pizza place open late. My hotel is pretty close to campus, so I figured there would be one close and of course, there was more than one. I chose the one that wasn’t quite as close to Memorial Stadium…I think. I went to the area I wasn’t familiar with tonight so I could stop by the other one after I get done with work tomorrow evening which I believe is closer. I’m probably wrong, but oh well. 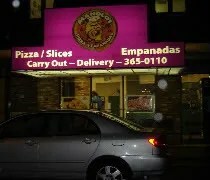 The one I chose is called Manolos Pizza & Empanadas and it sits right next to popular the night spot The Cannopy Club.